10 x 10 Gazebo - Who Has The Best 10 x 10 Gazebo? A 10 x 10 gazebo can act as the perfect focal point for a garden setting, adding a timeless touch of class or a natural place to gather for a barbecue or dinner party. They can be very functional as well, offering a shelter from both the sun and rain as well as allowing the user a view across the garden as a whole. The ten foot by ten foot size is becoming particularly under, as it’s large enough to cover a small group of people but not so large that it will take up too much lawn space. If you’re looking for the model that meets your specific needs, help is at hand with our WhatShed guide to the bext 10 x 10 gazebo that can be bought online in the UK today. When compiling our league table we had to consider just what it is that makes a 10 x 10 gazebo a great feature. We’ve taken into consideration the initial price tag and the overall value for money that represents, the durability of the materials used and any warranty period that comes with it, and the aesthetic appeal of the structure. 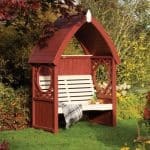 In this way we believe we’ve found a worthy number one 10 x 10 gazebo, as well as four high quality runners up. Congratulations to the Budleigh hexagonal gazebo which gains the accolade of being our top rated 10 x 10 gazebo, thanks to its classic good looks, long warranty period, and good value for money. 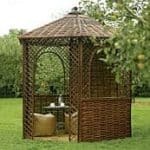 From mid sized gazebos such as these to large scale plastic sheds, and all kinds of garden building in between, WhatShed bring you in depth and independent reviews that can help you make the right purchasing choice every time. A 10 x 10 gazebo will always be a highly useful garden building, as it will not only be a much loved garden feature that could add value to your property, it provides a perfect shelter, whatever the weather. This Budleigh gazebo does much more than that however, as it’s a very attractive and well constructed building that will become a talking point in its own right. 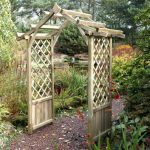 We found the hexagonal design eye catching from the moment that we saw it, and we were pleased to see that trellis panels take up four of the sides, with a mirrored lattice panel filling another; this mirrored panel can help create the illusion of a longer and larger garden. This has the look of a high glass 10 x 10 gazebo, so we were glad to find that when we looked into it further the quality of components didn’t let it down. The sustainably sourced wood has been smooth planed and then pressure treated, to give it long lasting protection against wet rot. So effective is this treatment, that it comes with a 15 year guarantee which is as long as any that we’ve seen on the gazebos that we review. This combination of good looks and excellent durability take this straight to the top of our league table of the very best 10 x 10 gazebos. 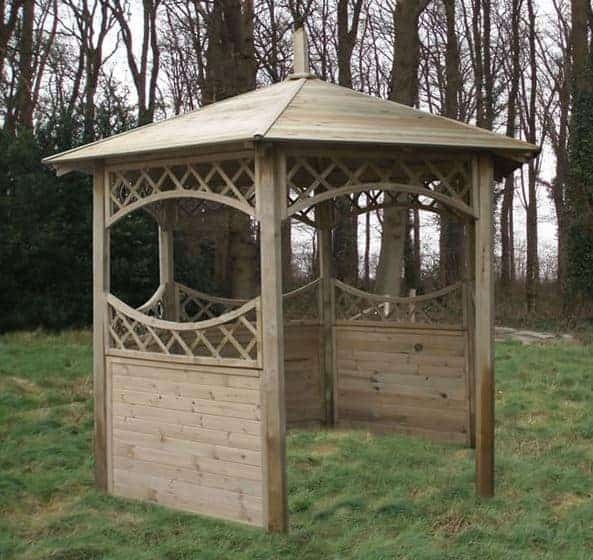 This 10 x 10 gazebo is another highly attractive garden feature, even though it features four open sides rather than incorporating lattice work. One reason that we found it so attractive is the ornate roof which is slatted in a Venetian blind style. Thanks to its clever design this is still effective at keeping rainwater or even snow away, and yet it allows a lot of light to come flooding in to the central area. The peak height of this apex roof, at 3.31m high, is also greater than on any other 10 x 10 gazebo we’ve reviewed, and so it creates a feeling of space and comfort. The other thing that we really liked about this particular gazebo is that it comes with an integrated deck base as standard. This is an ideal place to entertain guests or to hold a barbecue, and it’s very weather resistant as well. 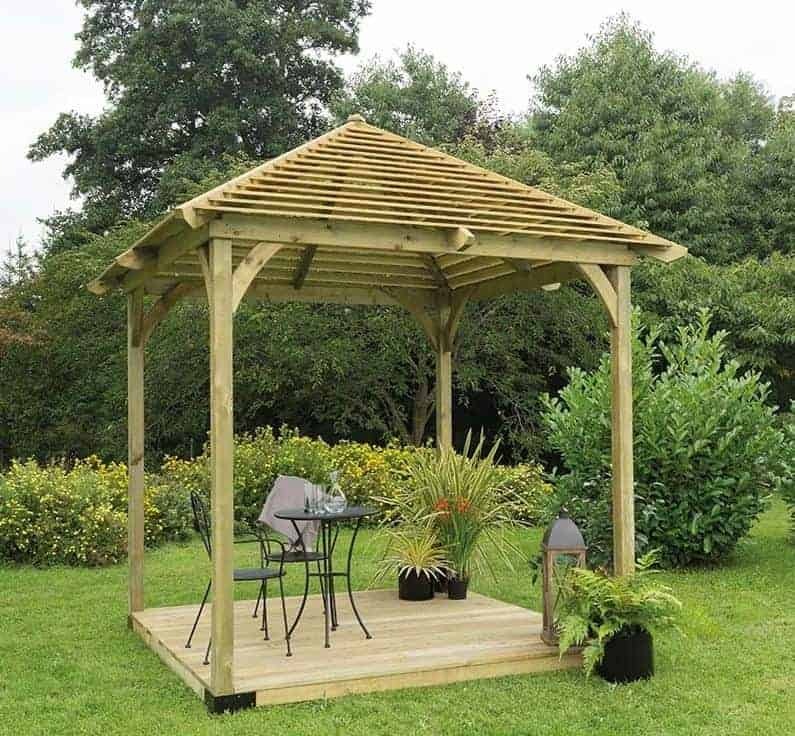 We were pleased to see that all of the wood had been pressure treated, and as this includes the deck it means that you won’t have to worry about the threat of ground moisture that can be a problem to other gazebos that feature a wooden base. 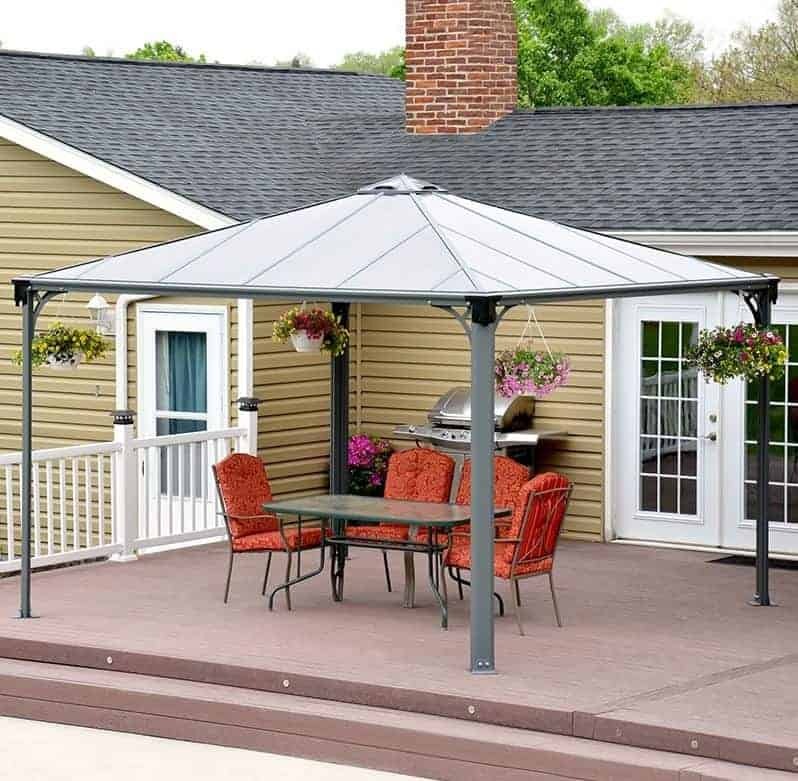 If you like the look of this gazebo but feel that it’s slightly outside of your budget, there is an option to reduce the asking price by having it without the deck. Whilst nothing beats the traditional look of a timber 10 x 10 gazebo, we are increasingly finding models that are made of either plastic or metal. 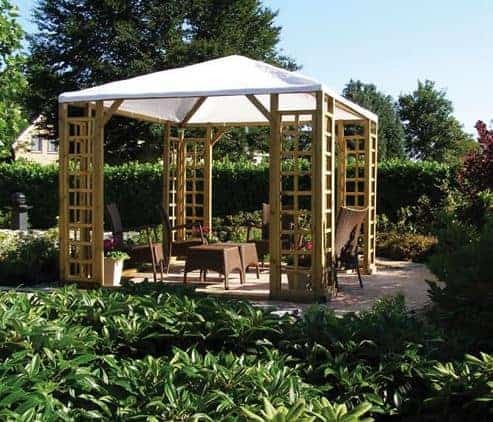 This Palram Palermo is a classic example of the benefits that a plastic gazebo can bring, and they help it achieve third place in our league table of the very best ten foot gazebos that can be bought online in the UK today. 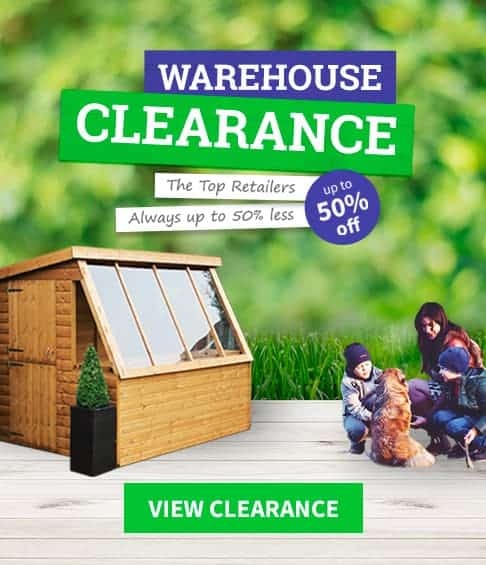 Foremost among these benefits is the price, as at not much more than eight hundred pounds it offers very good value for a mid sized gazebo, especially when compared to the timber models that occupy our top two places. Another advantage is that once installed, this 10 x 10 gazebo is maintenance free. The polycarbonate cladding is free from worries about rot or rust, and the high quality material won’t fade or yellow with time. The manufacturer’s confidence in their product is shown by the provision of a 10 year warranty, and we wouldn’t be surprised to see it last much longer than this period without any problems at all, especially as it boasts steel reinforcements that give it extra strength and stability in windy conditions. For that reason, we feel this is a perfect gazebo for those whose garden is situated in an area that’s exposed to the elements. This is the only fabric roofed 10 x 10 gazebo to feature in our top five league table, but whilst that means that it doesn’t boast the traditional looks of a timber gazebo or the sheer durability and practicality of a plastic gazebo, it does offer incredible value for money. Despite a highly affordable price tag of less than four hundred and fifty pounds, we were glad to see that doesn’t mean that corners have been cut when it comes to the materials used or the design of the structure itself, so that this is a gazebo that looks much more expensive than it actually is. We were surprised at just how attractive this 10 x 10 gazebo is, even though it costs around a half or a third of many other gazebos of a similar size. The canvas roof itself is an attractive shade of white, and once in place it’s very effective at keeping rain and out. 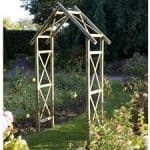 What we liked most about this gazebo, however, is that the four corners are in fact large trellises. This makes them an ideal place to grow climbing plants, creating a rustic appearance that will blend in well with any environment. It’s only the lack of an extended warranty period that prevents this highly useful, affordable, and unique gazebo from climbing its way into our top three positions. 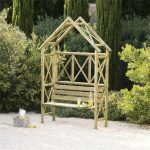 When a 10 x 10 gazebo has lattice work sides, as on this occasion, it becomes even more useful as it provides an extra growing space for climbing plants which will then make the structure more attractive still. 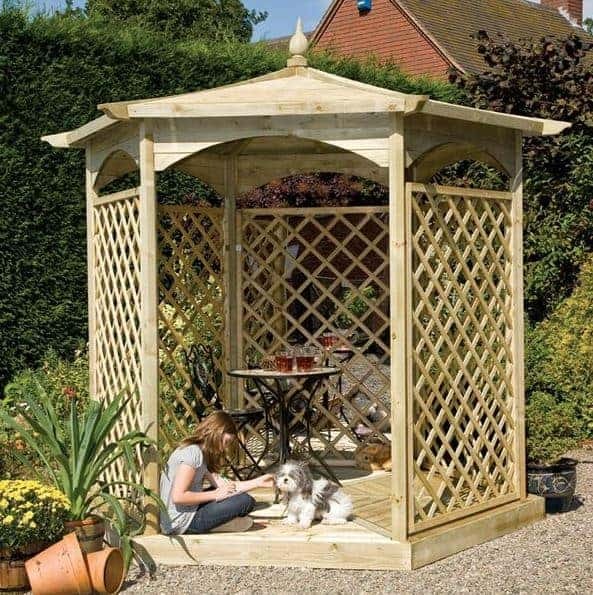 This is one of the best looking gazebos that we’ve seen, as it not only features latticing across five of its six sides, it also features a mix of both concave and convex panels, as well as all five of those panels featuring an oval cut away section to provide extra sunlight and ventilation to any plants and to the interior. We can easily imagine this 10 x 10 gazebo being used as a gathering point before a dinner party, and your guests are sure to be impressed. With the apex roof having a peak height of 2.70m as well, it’s a very accommodating garden building. Strong roofing felt is included on the roof as standard, although we were pleased to see that roofing shingles could be added as an optional extra to create an even more striking appearance. We were also pleased to see that the timbers had been pressure treated, although this doesn’t bring with it a long extended warranty period as we would have expected. It’s this omission that accounts for it taking only fifth place in our league table, but it should still prove to be a durable and reliable wooden gazebo.